Ellerbe was asked about the Canelo Alvarez scandal, particularly if he felt something was amiss when Canelo faced Floyd Mayweather in 2013. “No,” he said, “I’ve never had any indication or concerns about his (Canelo’s) preparations.” Yet Ellerbe admitted that Canelo’s failed drug tests were a very serious matter. “It’s…not good,” he said. “Not good or all. Any time your name is mentioned with PEDs it’s not good.” And what about the still scheduled May 5th bout between Canelo and middleweight titlist Gennady Golovkin? “The fight’s definitely in jeopardy,” Ellerbe claimed. “The Nevada Commission is the best commission in all of boxing. They follow the rules. They make good sound decisions led by Bob Bennettt. He’s a very fair guy. 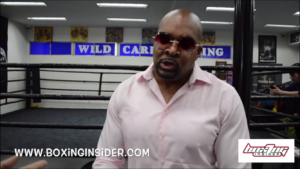 They’ll make the right decision.” Ellerbe’s personal opinion on the matter? “If he (Canelo) ingested knowingly, then he should be suspended for a very long time. If he didn’t, he should be cleared.” According to Ellerbe, performance enhancing drug use is something that’s definitely on his radar. Part 1 of @Jeandra LeBeauf's chat with Leonard Ellerbe on Gervonta Davis, Broner's upcoming fight against Jesse Vargas and his current focus. In part 2 of Jeandra LeBeauf discussion with Ellerbe, they discuss Mayweather Promotions working with Canelo and if they ever suspected PEDs and whether or not Floyd will be be fighting in the Octagon in September.